The Israel and Palestine conflict has been going on since 1948 and was highly speculated in the media last year starting November due to the killing of the Hamas military leader Ahmed al-Jabari following the 8 day war. It is not just about donating money, I have come to know that it is about the knowledge we get from it and how we apply it in our lives and in our societies. It is never too late or too early to help and educate ourselves with the situations of others, and to learn more I sat down with the president of the Kingston University Palestine society, Shahed Al Hindi and Vice-president, Tanzina Khondaker, both second year law students at the university. What I first wanted to know was what drove them exactly to this issue. “I was first introduced to it through my family because they are Palestinians and then because it is such a humanitarian issue, it’s hard not to get involved in the way people see UNICEF ads about Africa, it’s an ignored issue and it needs to be addressed,” said Shahed, 19. “I’m really in to human rights and I thought injustices are happening in Palestine. There are a lot of innocent people dying for no reason,” said Tanzina, 21. The society is not about bringing together the Palestinian culture, but rather inform and create awareness for all university students. “We have taken a different route from last year, where it was cultural society, this year we have taken a humanitarian route, focusing on the actual cause as oppose to the culture,” said Tanzi na. 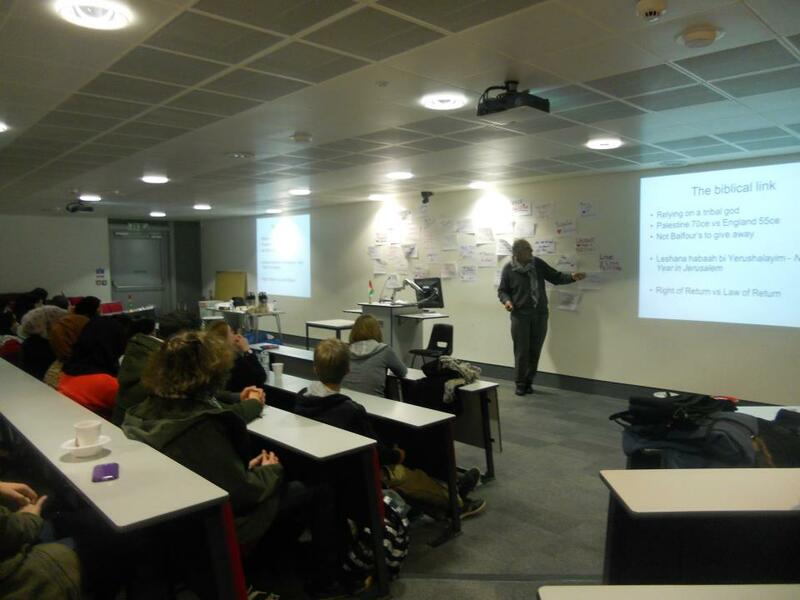 I had the opportunity to go to one of their events on Penrhyn Road Campus collaborated with the UN Society and held November of last year. 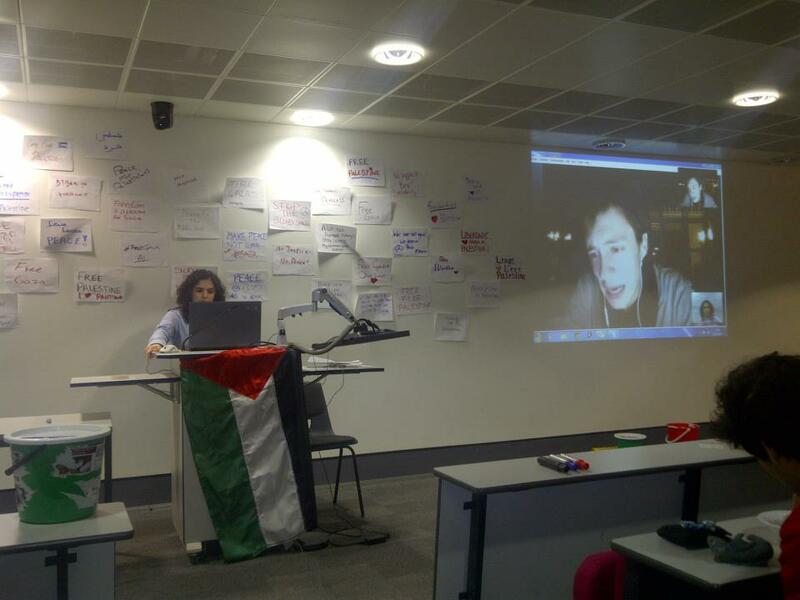 They had organized a Skype call with British documentary maker Harry Fear, who is based in Gaza at the moment, as well as with two university students from Gaza. 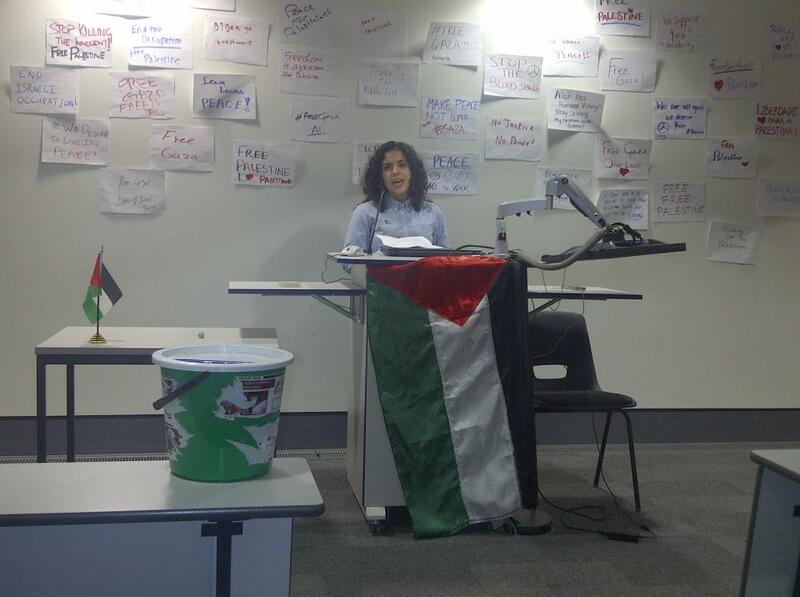 The event also had a lecture on boycotting Israeli products by Mike Cushman . We need to be aware of how the European Union and USA are on Israel’s side, there is a lot of trade between them therefore it is important for us to understand what we can do to avoid empowering their government. The information I received at that event stuck to me and there are things that are learnt only by attending and listening to people truly aware of the situation which can’t be read or seen by any media. The society also provides a lot of information on twitter and Facebook, which has helped them getting into contact with Palestinian poets, lawyers and the people mentioned above. “During the 8 day war, we were just bombarding people with what was happening. If you go to the BBC you are not going to see half of the stuff,” said Shahed. The money collected is donated to the Gaza victims through charities who work closely with the society. “They provide us with facilities and materials that we might need, so we are hoping to not just raise awareness but at the same time educate people because a lot of people don’t know about the issue,” said Tanzina. As Shahed and Tanzina are on the same course together they spend a lot of time organizing either events and contacting people for events. They invest on fewer events but with more content in them. However, now they are working on a whole year project. “Through out the whole year we are going to make sure that we raise enough money to do something. When we first started our main concern was water,” said Shahed. She explained to me how the Israeli Government have their hands on Gaza’s water supply and how they operate it. They can literally turn it on and off whenever they decide to. “We want to make sure they have their own water supply, something else to rely on. That was our main issue, then since the 8 day war we had to change it to humanitarian aid because people need shelter and medical aid, there was even a report on white phosphorus being used. These people need very urgent medical attention now,” she continued. The conflict is a controversial topic, who is to blame? The Jews? The Israelis? None of them, the problem is the Zionist ideology that supports the development of the state of Israel. They are the ones suppressing the Palestinians. How has it worked out then in Kingston? “We have never been discriminated, Kingston is such a wonderful place to be in, it is multicultural,” said Shahed. “At the fresher’s fayre people assumed we were going to have problem with the Jewish society but there isn’t any clashes at all. To be honest they are nice,” said Tanzina. “You don’t have to be Jewish or Israeli to be Zionist,” added Shahed. With the help and understanding from other nations Palestine reached the steps of progress by being voted last year in to the UN as an observer state meaning a recognition of their statehood. This is a symbolical meaning of hope for all Palestinians and people from all over the world. It is an inspiration for suppressed groups and a light at the end of a dark tunnel. “Everyone loves to belong somewhere and it finally gives them a proper place, not in an occupied territory,” added Shahed.